Through our colleagues in FEMA, MAG Ireland are informed that the supplementary Impact Assessment of the type approval proposals has now been published. 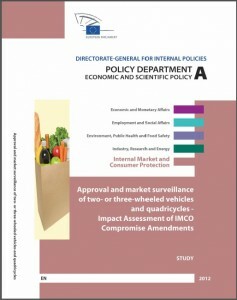 This document builds upon the previous impact assessment on the Type Approval proposals compiled by the European Commission, but only deals with the differences between the original proposal by the European Commission and the IMCO Compromise position as adopted back in December 2011. In conjunction with our colleagues in FEMA, MAG Ireland is studying this document in context with the Type Approval proposals as voted on at the IMCO Committee, and we hope to have a more comprehensive summary fairly soon. Our initial reading suggests the cost/benefit analysis negative for mandatory ABS on Scooters and OBD (on-board diagnostics) Stage 2. You can download a copy of the document from the MAG web site (PDF, 2.3 Mb) by clicking the link below. We’ll have more on this once we’ve had time to consider it fully. Update: As expected, the impact assessment came out against extending ABS to smaller motorcycles in the 51-125cc category on the basis that it’s prohibitively expensive. However, the IMCO committee responsible for the Type Approval regulations, which itself ordered the assessment, has since rejected the findings on the basis that the consultants who produced the report – London Economics – did not properly investigate the costs of ABS. London Economics simply used a flat figure of €500 as the average cost based on what the motorcycle industry representatives, ACEM, told them. It now appears that the IMCO committee will push ahead with its proposal to extend mandatory ABS to light motorcycles despite the position of the EU Commission which originally wanted either ABS or CBS in this category. However it is by no means certain that the measure will stand and there is still a chance that the Plenary of the EU Parliament will vote against ABS despite the recommendation of IMCO.